Ahh, the luxurious life of a college intern. And this is the EASY part of Matt's work today. Everything that is left less than 100-percent finished gets a note. The mind may forget, but pen and ink have an excellent memory. Our seats weren't completely thrashed, but they would look and feel better after being recovered. Removing the hog rings can be a pain, but with a little patience they'll all come out. The foam parts of our seat had held up really well. Once they've been recovered, they'll be as good as they were in 1967. 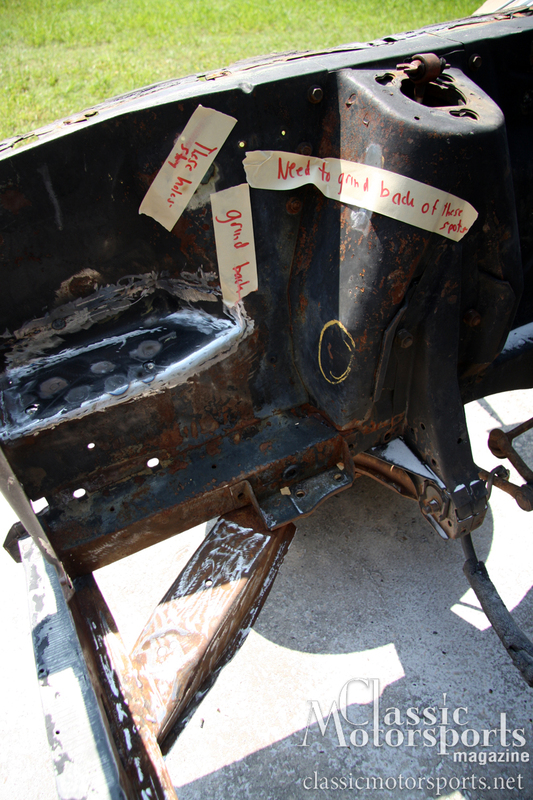 The seat frame was also in great shape, especially after a fresh coat of satin black paint. With intern Matt blasting the engine compartment, we turned our attention to the Mustang’s seats. We try to avoid sandblasting any part of a car. We almost never sandblast outside body panels, as they are too fragile and it causes them to warp. However, there’s always an exception: Our Shelby GT 350 had some surface rust around the front of the engine compartment, and we had to deal with it. The corrosion was most likely caused by fluids, such as battery acid and antifreeze, leaking over the years. 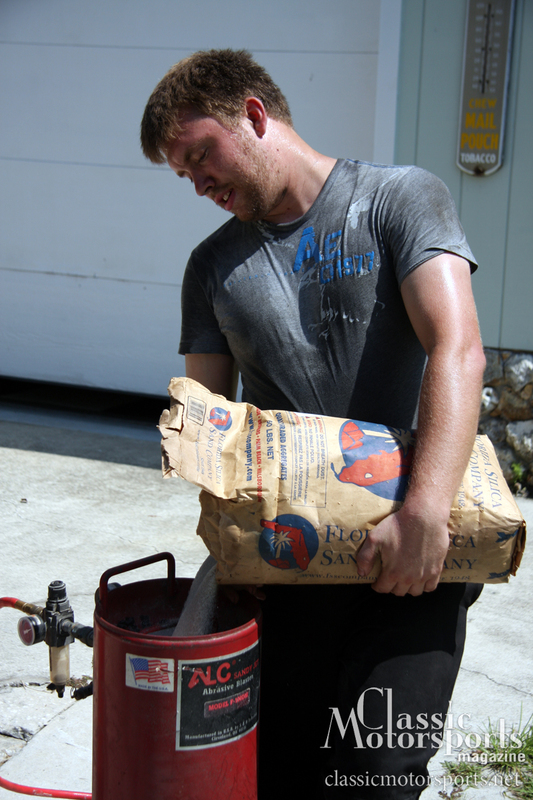 The quickest and most foolproof way to kill this rust once and for all is to sandblast the area back to clean metal. With intern Matt blasting the engine compartment, we turned our attention to the Mustang’s seats. While they were original and not that bad, they had the typical Mustang seam splits. 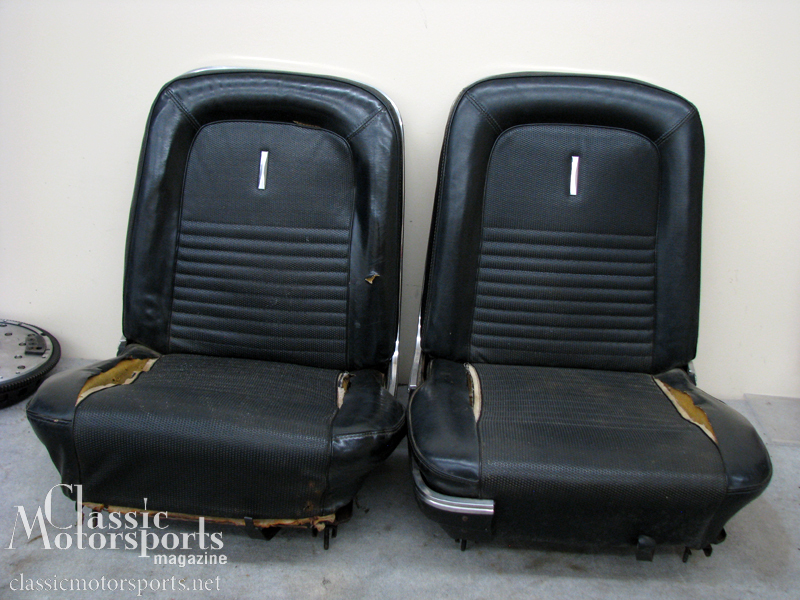 In the old days, before complete Mustang parts availability, we would have taken the seats apart, cut out the rotted panels, and replaced them with new vinyl that we matched to the best of our ability. Today, several companies make excellent reproduction seat covers. Even our deluxe 1967 Comfort Weave seat covers were readily available in our choice of colors from NPD. For just over $200, we could quickly and easily recover the seats with these new covers. 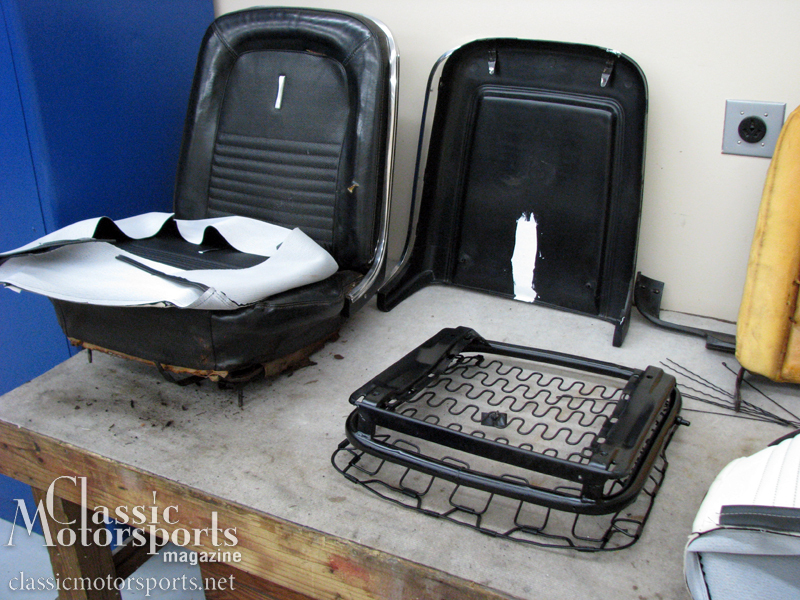 Our foam seat cushions were still in good shape, so Peter Geisler of Orlando Mustang recommended we reuse them; he felt the reproduction foam pads wouldn’t look as nice or fit quite as well as the original foam cushions. We carefully dismantled the seats, cut out the hog rings, removed the covers, and looked everything over. 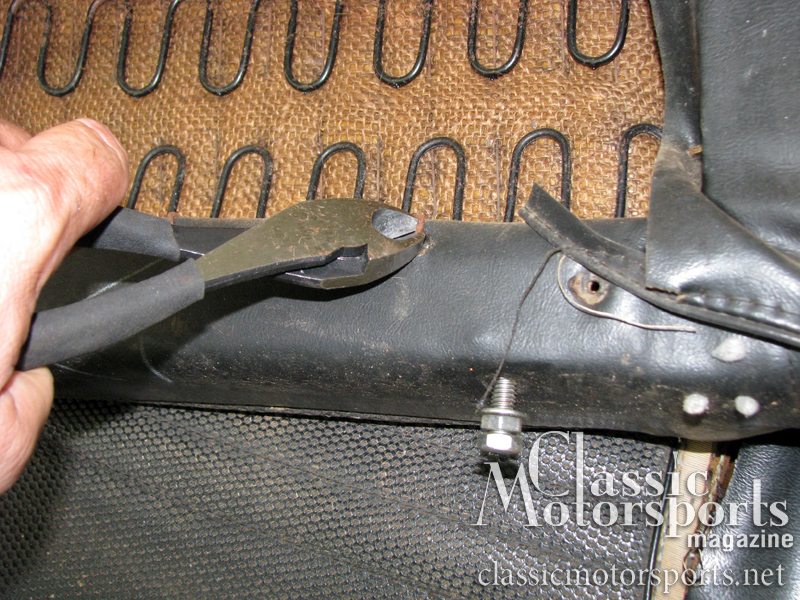 While our seat frames required no welding, the plastic seat backs (only available on Deluxe Mustang seats) had a couple of cracks. We ground out the cracks a bit, roughed up the surrounding surface, and applied Epoxo 88 epoxy. This stuff has never failed us, and the repair is holding up great. 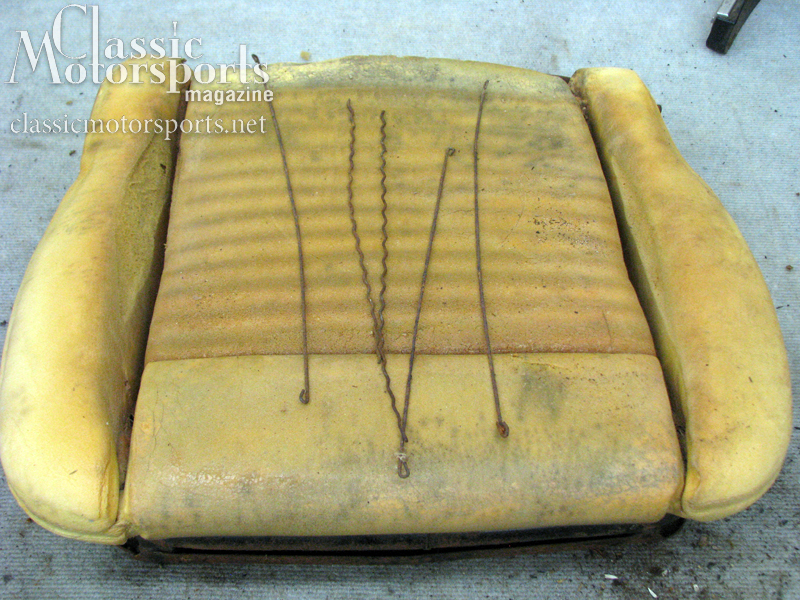 We then pulled the foam off the seat bottoms, as the frame needed paint and the burlap Ford used between the seat frame and the cushion had disintegrated. NPD even sells burlap to match the original material, so we used that instead of running all over town to find something similar. Recovering Mustang seats is very straightforward. You just need to photograph each step well so you can see how things go back together. Even though we’ve done this job dozens of times over the years, we still disassembled the seats one at a time to make sure we had a reference point to do it right. For example, there are pieces of wire that you put into the covers, then hog ring to the frame. You take your time and work from the inside of the seat to the outer edges. By the end of the day, it was time to take the tub to The Body Werks. As we were heading out of town, we decided it was best to let Tom Prescott and his crew do what they do best: Finish off the underside of the car in the factory-correct reddish-brown primer, then prep and paint the engine compartment in the original satin black. 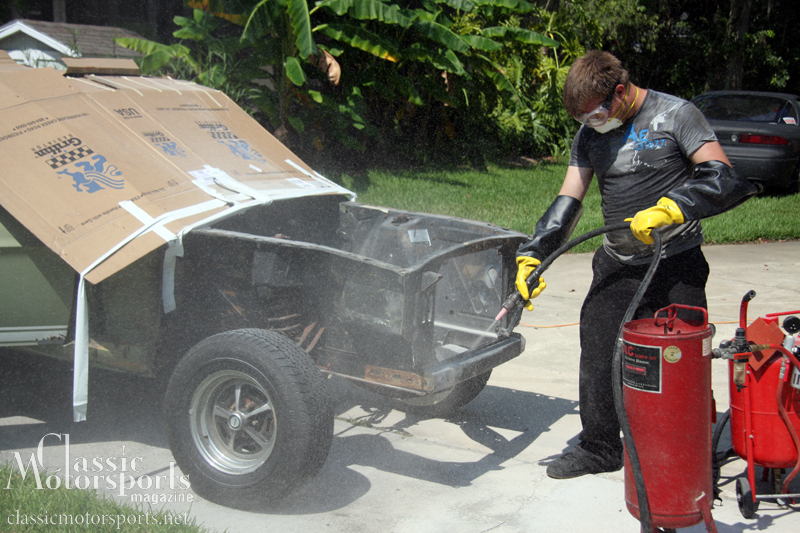 We try to avoid sandblasting any part of a car. We almost never sandblast outside body panels, as they are too fragile and it causes them to warp. However, there's always an exception: Our Shelby GT 350 had some surface rust around the front of the engine compartment, and we had to deal with it. The corrosion was most likely caused by fluids, such as battery acid and antifreeze, leaking over the years. The quickest and most foolproof way to kill this rust once and for all is to sandblast the area back to clean metal. Recovering Mustang seats is very straightforward. You just need to photograph each step well so you can see how things go back together. Even though we've done this job dozens of times over the years, we still disassembled the seats one at a time to make sure we had a reference point to do it right. For example, there are pieces of wire that you put into the covers, then hog ring to the frame. You take your time and work from the inside of the seat to the outer edges.